Slate roofs have a lot going for them in terms of longevity, durability, and classic beauty and style. Much of it is well known, some of it is not so well known. Yes, natural slate is among the most costly and alluring roofing options for homes, but it is certainly not intended to for every roof structure. The high price of slate is perhaps one of its most significant drawbacks. It may cost about the same to cover a roof square (100 sq. ft.) with high-end natural slate, as it does to cover a small roof, say 1,000 sq. ft. (or 10 squares), with asphalt shingles. Yet, going strictly by price alone would be an entirely unfair comparison between the two. 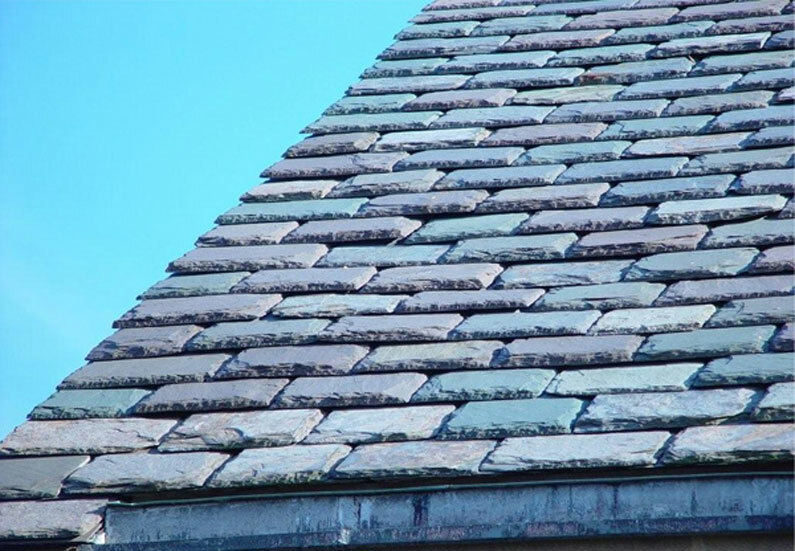 Slate holds significantly more value than Asphalt shingles. On the low end, the cost of natural slate material alone is about $5 per sq. ft. While that makes it sound almost affordable, keep in mind that asphalt shingles, on the low end cost less than $1.00 per sq. ft. of material (based on buying 3-tab shingles by the bundle). On the high end, the cost for just material is around $15 per sq. ft. Probably a little lower, but we’re looking to be fair. Pro Tip: A fair price range for natural slate tile materials designed for residential applications is $6 to $8 per sq. ft. Installation Cost Per Sq. Ft. Installation costs vary, though it is fair to double the price within the material prices range from above. Such that it would be $12 to $16 per sq. ft. of slate roofing installed. For most roof types, a professional roofing contractor is your best bet for getting that quality installation, but with slate, it is best to go with a slater or a slate roofing specialist. While, a non-specialist or a typical roofer may at first feel confident about their ability to install it, they would often be wrong. But, if you are really tempted to cut labor costs and go this route, be sure to ask them about their experience and for references or examples of their previous slate roof installations. As this page on Roofing Calc points out, a poorly installed slate roof is a like not having a roof at all. As noted in our opening, slate roofs aren’t for every home. They add enormous weight to a home, at about 800 to 1500 pounds per square. If you live in a snow region, that possibility of additional weight of heavy snow must also be considered. A slater or specialist will take this into account before starting a job. Generally, larger homes are best suited for handling a slate roof. Yet, it is quite possible, a smaller, well constructed home can effectively hold a slate roof. Take a look at this checklist from Greenstone Slate, to help understand what goes into the installation. Putting the cost of slate into proper perspective means considering the value it offers. An asphalt roof will at most last 50 years, and averages 20 years. Wood averages 30 years. Metal (namely steel and aluminum roofs) will last 35 to 60 years on average. 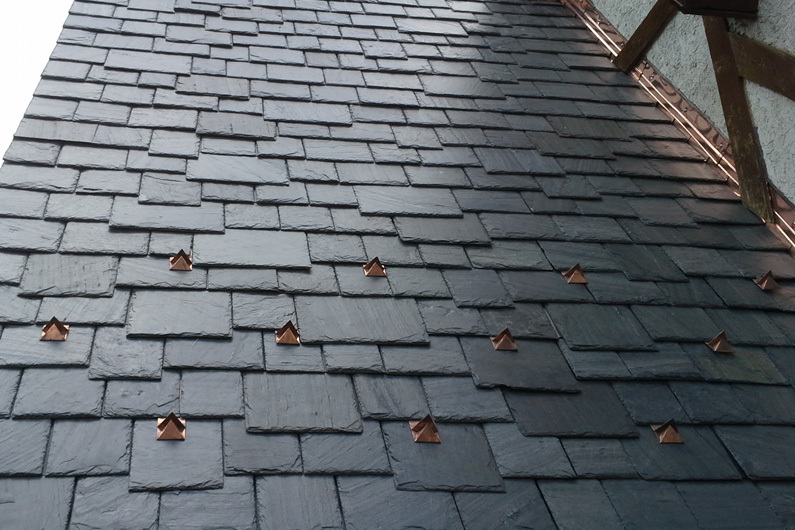 Slate can last up to 100 years when properly installed. Being a natural stone, it is a dense material, and being slate roofing, it is thick and durable, and when properly installed, then multiple centuries are possible in terms of roof longevity. 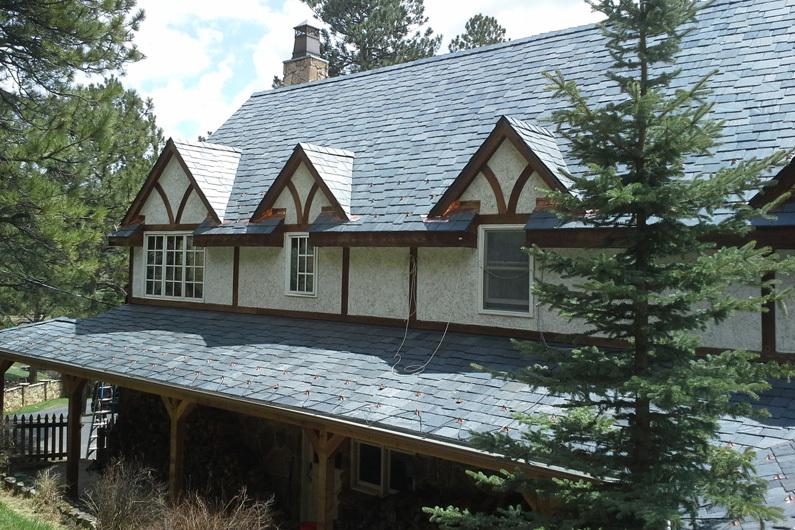 For the reason of longevity, but not only that reason, Slate roofing has tremendous ROI. Add in the idea of natural beauty, and homeowners benefit from recoup value at time of sale of a home with a Slate roof. Metal tends to have the highest ROI at around 86%, and while there is not clear cut data on ROI for slate, it is likely in the low to mid 80 percentile. Being a natural material slate is, without a doubt Eco-friendly. It’s longevity alone ensures this. While an asphalt shingled roof will go through at least 5 tear-offs during a 100 year span, thus adding to landfills, the Slate roof will still be going strong. And the kicker is that slate is, or can be, recycled. With high density material, comes the idea that Slate is essentially waterproof, is not affected by fungus or mold, unable to be burned and highly resistant to temperature fluctuations. A Slate roof may conjure up images of all black, uniform shaped tiles that cover a roof in a rather bland pattern. While that’s possible, and is perhaps even the norm, that only scratches the surface of what options are available, should you choose to go with Slate. The thickness, or grade is perhaps the first option of consideration. It ranges from thin 3/16 inch to thick as much as one inch. Did you know? Thickness is a substantial factor in price of the material, and then in installation as heavier lots of Slate are more challenging to work with. Between 3/16th and 5/16th of an inch is considered nominal thickness. Size of each piece, along with texture and shape are also an area of consideration. There are frankly too many variations to list them all, but rectangular pieces in uniform sizes for a lot (meaning the order for your roof) is going to be consistent, unless specifically specified to be different. Check out this page from GreenstoneSlate.com about Random Width Slate. Texture and color are where things get interesting. Texturing, or surface features, occur naturally with how the rock is exposed to pressure over (very) long periods of time. It is generally flat and mainly smooth, but again there is a whole lot of variation that can and does occur. Same goes with color. Common colors are green, gray, black, purple and red. Sometimes flecks of colors appear to provide multicolored plates, or whole surface colors give it its unique look. Then there exists the possibility of mixing color tiles throughout the roof. Take a look at this page from the Vermont Slate Company for some ideas. 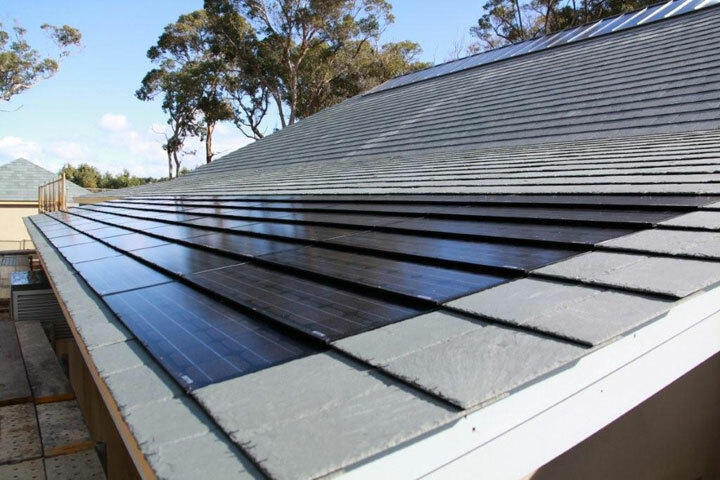 Added to all this is the idea that a Slate roof can incorporate modern technology, or what Greenstone Slate calls its integrated solar panel option. Pricing. Compared to all other materials it is very expensive, though the value it offers must be taken into consideration on this point. Fragile. While it is extremely durable, it can be damaged just by walking on it haphazardly. And because tiles are rather unique to a lot, replacement tiles aren’t exactly easy to find. Benefits significantly from specialists who have experience with such installations, or conversely improper installation can be a huge detriment. Not for every home, need specialist to determine if your home can handle the enormous extra weight.